When audience members entered Franklin & Marshall College’s Mayser Gymnasium Nov. 1 and sat down with their free pizza slices, they likely did not expect to be asked to embrace discomfort. But the day’s speaker, Megan Red Shirt-Shaw, had a task that she was ready to assign. “I am going to challenge every single one of you to be and stay uncomfortable, taking time to acknowledge your own privileges and non-privileges,” Red Shirt-Shaw said. Throughout her talk during F&M’s Common Hour, a community conversation conducted each week classes are in session, Red Shirt-Shaw alternated these calls for leaning into discomfort with encouraging messages for students, particularly students of Native heritage. Ultimately, she spoke to inspire the next generation to pave the way for progress. Red Shirt-Shaw, an enrolled member of the Oglala Sioux tribe, is founder of “Natives In America,” an online literary publication for Native American, Alaska Native and Native Hawaiian youth. She is currently pursuing a doctorate in organizational leadership, policy and development with a focus on higher education at the University of Minnesota. Before getting too deep into the hour’s topic, Red Shirt-Shaw made sure to let the audience know that she could only speak for herself and her experiences. She asked for them not to project the responsibility of spokesperson for all indigenous peoples onto her or others with similar heritage. Red Shirt-Shaw spoke passionately on a myriad of topics related to indigenous people and identity. Of specific interest was the problematic relationship between education and Native people. From the erasure or oversimplification of Native histories and identities in American history books to the lack of representation of Native students and professors in higher education, there was much to unpack and only an hour in which to do it. 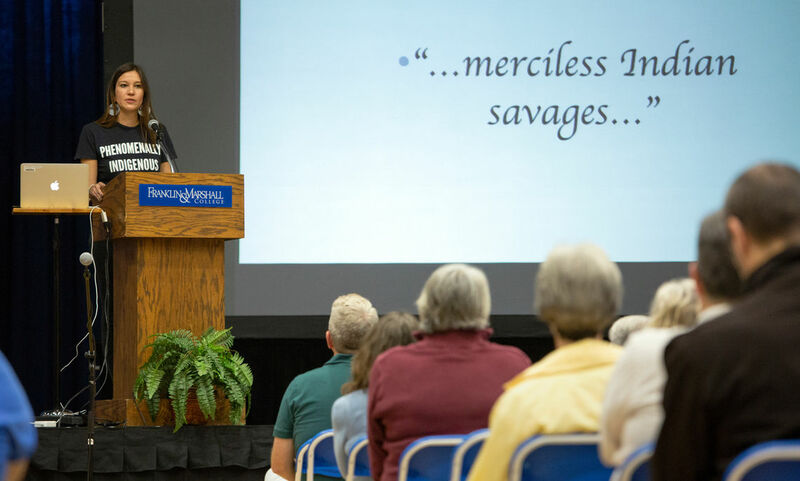 Particularly difficult to face were the answers to “What does the U.S. Constitution say about Native people?” (they’re referred to as “merciless Indian savages”) and how the College’s founders felt about Native Americans. Benjamin Franklin, who also founded the University of Pennsylvania, where Red Shirt-Shaw received her undergraduate degree, was particularly harsh in his view on indigenous peoples. She went on to comment about how difficult it was to walk around Penn’s campus where statues of Franklin served as a reminder that its founder did not intend for somebody like her to attend his institution. But Red Shirt-Shaw reassured the audience that she didn’t pose these questions to make them feel guilty. “I just want you to understand what reality looks like for me as one person and what it may look like for some of your classmates,” she said. At the heart of Red Shirt-Shaw’s message was not just that the Native people of this country continue to struggle, but that we must all work together by having uncomfortable conversations and speaking up about our own individual experiences in order to enact positive change.